Photo Galleries Rotary Annual Quiz Italian Wine Tasting 2019 Pensioners Afternoon Tea Party 2019 Teddy Tombola - Christmas in Epworth 2018 Epworth Rotary OAP Afternoon 2018 Annual Rotary Quiz 2018 End Polio Now ENTERPRISE DAY 2018 Restart a Heart Day Helping our Local Community Teddy Tombola 2017 HANDOVER 2017 FESTIVAL OF THE PLOUGH Epworth Show Spinal Injuries Association Macmillan Coffee Morning FESTIVAL OF THE PLOUGH Polio Eradication Music In The Gardens Lindsey Lodge Hospice IFFR UK Flyer of the Year Award 2016 Epworth Show District 1220 - End Polio Now - Sponsored Walk 1st Charter - Ceilidh 2nd Charter - Amsterdam!! 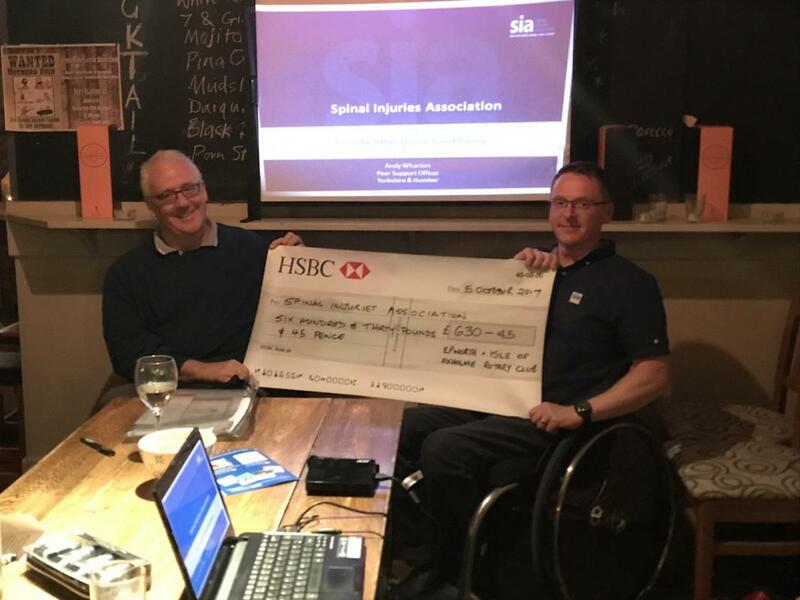 At a meeting of Epworth & Isle of Axholme Rotary Club it was a great pleasure to hear Spinal Injuries Association Peer Support worker Andy Whorton describe what the charity does an dhis role in particular. The club formally passed a donation cheque in the sum of £630.45 to the SIA.